Always check with your vet before adding any supplements to your dog's diet. Your dog may be eating yogurt because he's on a low-carb diet, but that's unlikely. There are several reasons why you might want to add yogurt to your dog's diet. While there is no real science behind the idea that yogurt helps dogs, there is anecdotal evidence to support the idea. Some dogs have chronic ear infections due to their anatomy. If your dog is the kind of pooch with long, floppy ears, you've most likely already experienced problems with dirty ears. 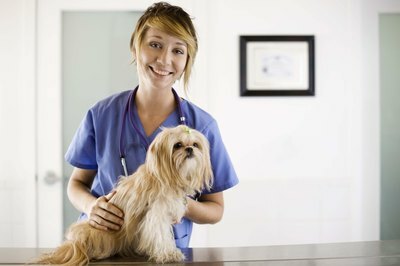 All dogs should have their ears checked regularly and cleaned when necessary, but those with floppy ears need special care. Yeast and other pathogens form within the dark, damp, anaerobic and hospitable place found inside a floppy-eared dog. Yogurt is well known for its ability to fight against yeast. If your furry friend is feeling a little under the weather and has to take antibiotics, ask your vet about adding some yogurt to his food prophylactically to guard against the (almost) inevitable yeast infection that will follow soon after the course of antibiotics is done. This is because antibiotics do not discern among good germs and bad germs. They wipe out all bacteria. All animals carry some candida in their system. When the good flora in your body is left alone to "do its thing," it keeps yeast takeover at bay. When the good flora is wiped out along with the pathogen the antibiotic was meant to target, yeast has no barriers to taking over the system. Yogurt not only helps with yeast infections in the ears, but also other parts of the body where candida breaks out. Yogurt has probiotics, which helps keep the flora in your dog's intestines happy. If your dog has indigestion -- manifested by stomach noises and gassiness -- you might try adding a little yogurt to his diet because the acidophilus in the yogurt, along with the healthy probiotics, can help. Be careful in this instance, however, as many dogs cannot tolerate dairy products and you are liable to make the situation worse, not better. If your dog's stools become a little more runny than usual, or his symptoms seem to worsen, stop the yogurt right away. Use about 1 to 3 tablespoons of yogurt, according to the dog's size. Some feed at every feeding, others only offer yogurt several times a week. Some dog owners prefer to only give yogurt in the presence of an active yeast infection or when the dog is on antibiotics. If you feed kibble, mix the yogurt so that it coats the kibble. If feeding canned food, simply mix in the yogurt with the canned food. Or offer yogurt only as a special treat once in a while, in which case you would place the yogurt in a bowl and serve it to your dog. Never use flavored yogurt, as the extra sugar is harmful to your dog. Only serve plain yogurt. Use fat-free if your dog is overweight, otherwise, regular yogurt is fine.